With Triathlon continuing to grow at a steady pace it has become increasingly evident that we all as athletes need to become aware of our consumption and traveling habits. Kelly Dunleavy of Bohemian.com recently took a look into the growing pains and changes taking place in the triathlon community. The article focuses on the growing sentiment for sustainability and emphasizes the measures that Chris Lieto is taking with The Green Athlete. "Chris Lieto, a professional triathlete from Danville, has become a poster boy for environmentally conscious training and racing. 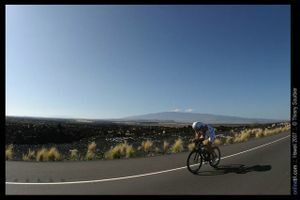 Lieto has been a pro for six years, has won some of the sport's top races and placed sixth in last year's Ironman World Championships. And he's using his visibility to launch a new challenge, the Green Athlete. "I don't want it to just be a wasteful time. I want it to have some purpose, to leave it better in some way," Lieto says of his sport. Lieto's sustainability initiative is focused on bringing together different environmental programs and bringing more attention to the issue. Many of his sponsors already have their own programs, such as Trek's One World, Two Wheels bike-riding project and the Soles4Souls shoe recycling venture. By working with his sponsors, with other athletes and with local races, Lieto is spreading the word about simple things triathletes can do, such as commuting to races, buying in bulk and with less packaging, and using reusable bottles and water filters. " Make the pledge and start riding more to save the World. Tips for racing at Vineman! Go Green! As most of you have heard, Vineman is going green this year. We'd like to let everyone know what to expect while you are here for the race and ask that you do your part to make our event as "green" as possible! All of the information is included in this email or you can click on this link and it will take you to the information on our website. What Vineman is doing to be a "greener" race. Recycle all plastic one use bottles. Collect, wash and donate all other water bottles. Recycle all energy bar wrappers (through TerraCycle's "wrapper brigade"). Compost fruit scraps from fruit used on the run course. At registration your "goody bag" will be a reusable shopping bag; so be sure to take it home with you and keep it in your car and use it when you go shopping! Did you know your run bib is recyclable? That's right. They are made out of Tyvek which can be recycled. Also made out of Tyvek is the wristband you will receive at registration and must wear for the entirety of the race. Notice a change in your bike number? We've switched from a large paper placard style bike number to smaller sticker number that gets placed on the top tube of your bike. This reducing the amount of paper used and eliminates twist ties. We have redesigned our signage in the transition areas. Not only is it more visible but it is reusable, instead of single use. You won't find any bottled water at the finish line this year. Instead we have 5 gallon jugs of filtered water along with paper cups for your use. All plates and napkins at the athlete food tent are from 100% recycled material and the utensils are made from corn. Composting at the food tent. We will be composting all of the fruit scraps and peels that come from our finish line food tent and from the run aid stations. Recycle your swim gear bag. Our bags are recyclable and made from 65% recycled plastic and printed using water based inks. There will be a bin set up adjacent to the swim gear claim area. So, if you no longer need or want your bag, please drop it in the recycle bin or any recycle bin! The bags come from EARTHPACK, a company in Irvine, CA that has been making recycled bags since 1990. Akeena Solar will be at the race to power both our expo and finish line. Bring a reusable water bottle with you and use it throughout the weekend. Be sure to put recyclables, garbage, and compost in the proper bins at the race venues. Thanks for your support and we look forward to seeing you all this weekend.